I'm sitting here at my Mom's house, watching the Macy's Thanksgiving Day Parade on TV and enjoying a view of one of her trees out the window. 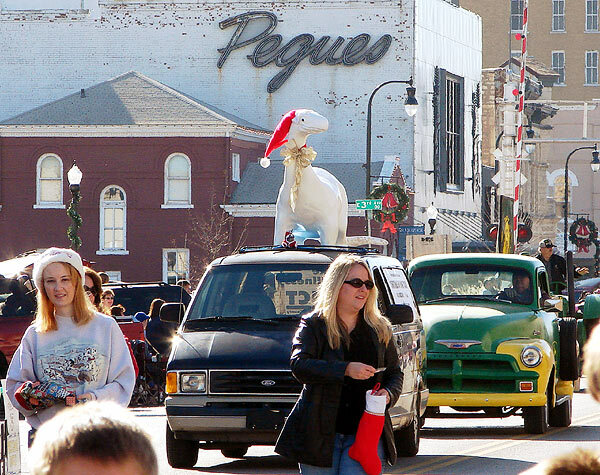 Of course, the Hutchinson, Kansas, Holiday Parade was this past Saturday. Granted, we don't have the huge balloons and such, but I can guarantee that nobody in our parade lip-synced and we beat NYC by five days. Take that, Big Apple. While I watch the NYC parade, I thought I'd let Ace Jackalope and Clarence the Dinosaur show you some of the older cool neon signs along the section of Main Street that is Hutchinson's parade route. Although Hutchinson's parade was a morning event, I'm sprinkling in a few night shots. I don't think the neon for the Sleep Shoppe, 11 North Main, is very old. Its luminosity gets lost in the new bright downtown lights; I think they need to be dialed down a bit. 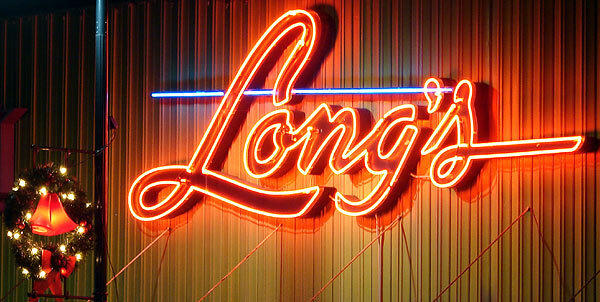 The blue neon line above the red cursive neon of Long's, 110 North Main, may be indicating a stylized needle; Long's is a clothing store. 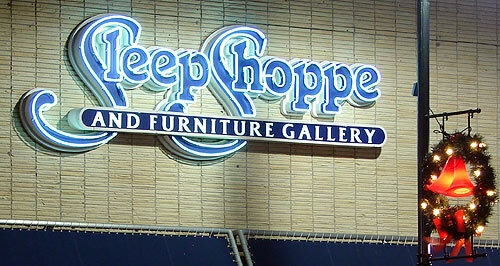 Company president William Long says the sign was moved here from a previous location in 1972, and dates from about 1965. Pegues clothing store, near 3rd and Main, has been out of business for a few years, and the building has yet to find another semi-permanent use. The neon sign is still there, but is never lit. Russell Crump's Photo Archive shows a vintage postcard of the building. 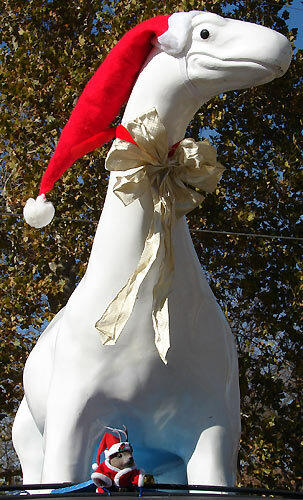 Pegues windows are being used for thematic Christmas displays at the moment. 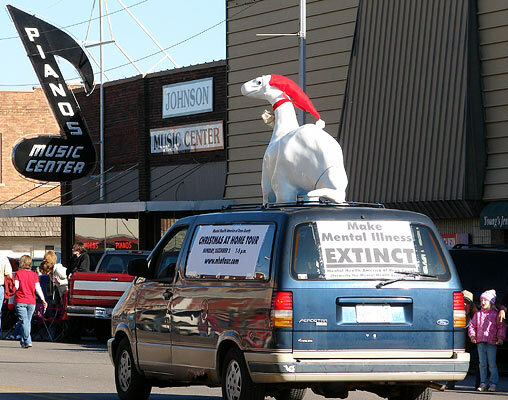 I loaned a couple of older snowmen for a display promoting the Reno County Mental Health Association's Christmas at Home Tour. The one at far left was made by either the Harold Gale Display company (spelling of "Gale" is speculative) of Kansas City, or its successor, the Superior Display Company. 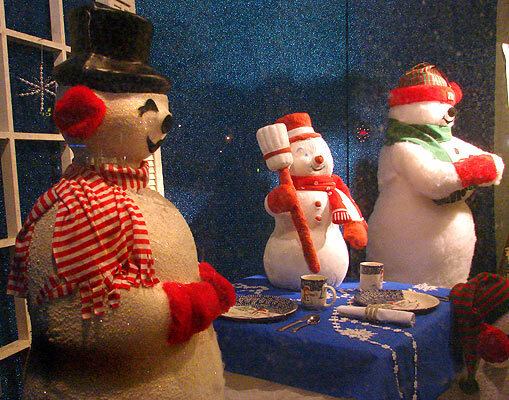 Superior Display Company definitely made the 7-Up snowman on the right. I posed his arms so as to hide the 7-Up can in his hands. I didn't shoot the parade passing the Flag Theater this year, but I have touched on it before. Here it is in motion on a recent October evening. 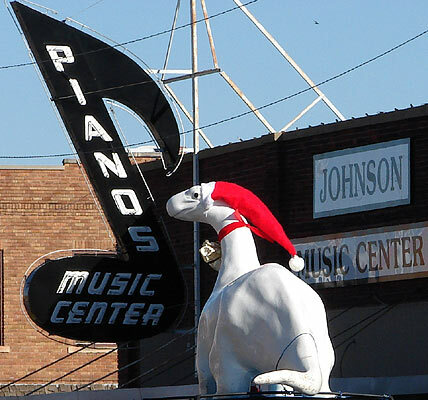 Clarence passed Johnson Music Center at 420 North Main. 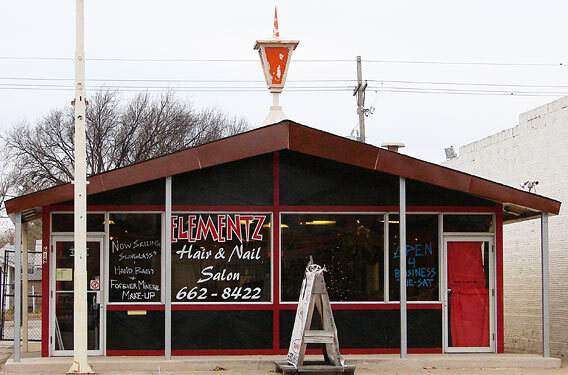 The sign was placed there in 1953, according to owner Craig Johnson. It is a giant 8th note. Not that I knew that; I had to ask someone. I shot it at night a few weeks ago. 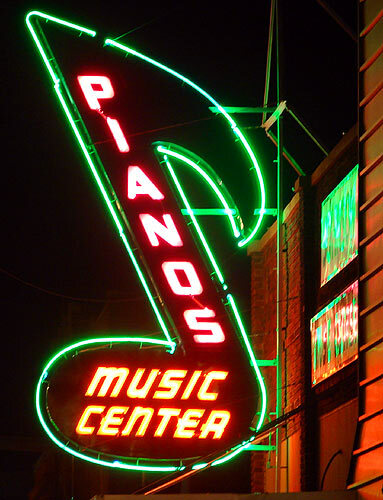 In all my travels, I've never seen a neon music note this big. It's one of the treasures of our area; I know that other neon sign aficionados will understand. As a matter of fact, I just nominated it for the 8 Wonders of Reno County. And here is a short video clip. The green rim of the note flashes. Why do I shoot admittedly low-res video clips of these things and display them? Because, as far as I know, there are few tapes or records of the way these things worked. You'd be surprised how hard it is to find out later on how a defunct sign worked, as far as its flashing, motion, etc. Mind you, as far as I know all of the signs I am portraying are in safe, stable hands, but if you ever have any doubts that the commercial architecture and signage of a city needs to be recorded, archived and placed online, I have one name for you: Greensburg. I tossed in this shot because the car looks cool. I have no idea what it is, but it's passing the 500 block of North Main Street. 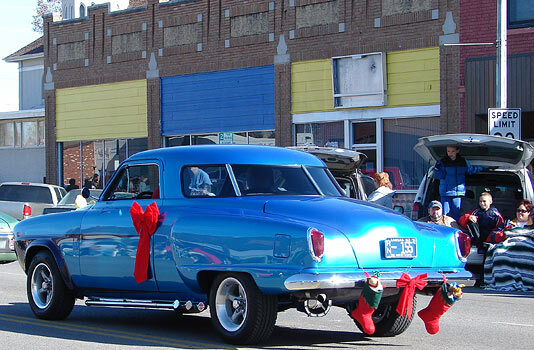 Added November 26: reader Jim Terrell of La Center, Kentucky, tells me this is a Studebaker. Thanks, Jim! 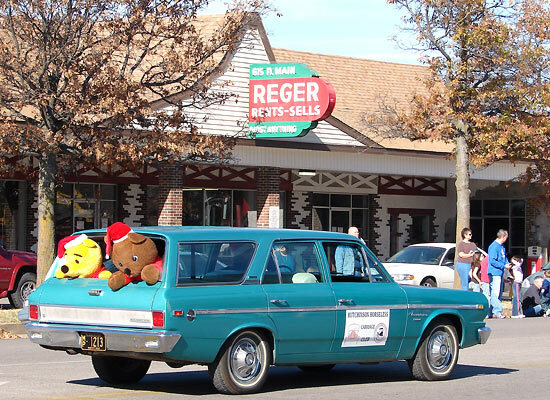 The building that is now Reger Rental was built as a Marland Oil gas station back in the 1920's, according to owner, Perry Reger. Now this is a beautiful story of owner-motivated restoration. The sign was placed on the building when it became Reger in 1949. The cost at that time was about $500. In the 1970s, the sign was removed in favor of the flat-against-the-building signs so popular at that time. 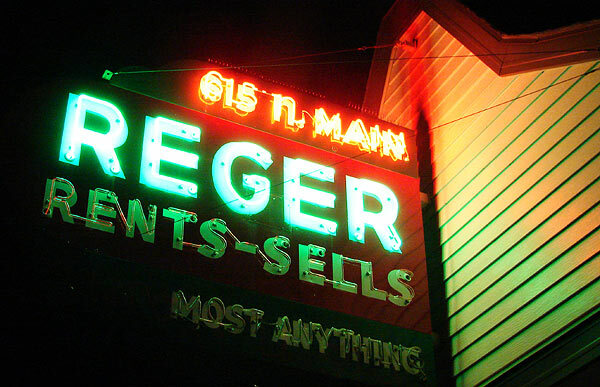 In 2000, Reger had the old sign restored at a cost of $5000 and placed it back where it had been. I asked Reger why he had the sign restored and replaced. "Wanted to" was his response in tone of voice that was justly proud, like that of a man who had restored an old hot rod. I wish his attitude would catch on. Just north of Reger's is this anomalous little lantern-topped building that I've always wondered about. It has hosted a travel agent specializing in cruises and now it contains a hair and nail salon. Perry Reger told me it was built as Malt Village, part of a a small chain of malt shops back in the 1960s. I wish I had a picture of that. There is more cool Main Street neon both north and south of the parade route, which ran from Avenue B to 11th Street. I think I'll show that another time. On the way back to his residence, Clarence cast a fine shadow on one of Hutchinson's brick streets. 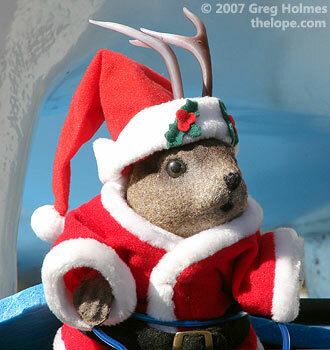 We wish you a Happy Thanksgiving and a wondrous Christmas season.